Do you want to learn how to market yourself and your business on Google+? Are you looking for a resource to guide your Google+ marketing efforts? Whether you’re marketing on Google+ as an individual or as a brand, these expert articles will help you manage your presence, promote contests and use Google +Post Ads, and more. 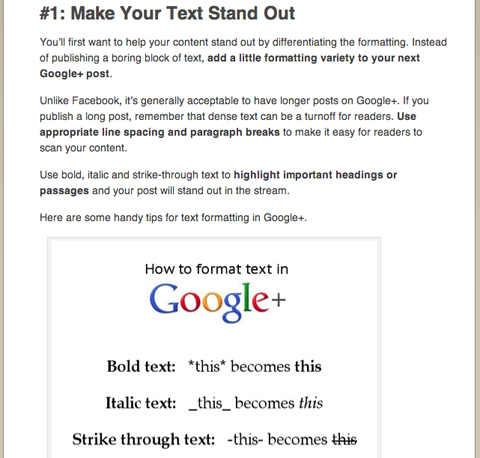 Each of these articles will help you understand and master a specific part of marketing on Google+. Google+ Success: What Your Business Needs to Know About Google+: In this Social Media Marketing podcast episode, Martin Shervington shares why he values Google+ and the benefits you can get from it. Listen in to learn what Google+ can offer your business and the best ways to get started. Start networking with a personal profile, and then add a business page. How to Use Google+ Collections for Business: Google+ Collections allow you to categorize your updates by topic, which helps your followers quickly find updates for the topics they’re interested in. 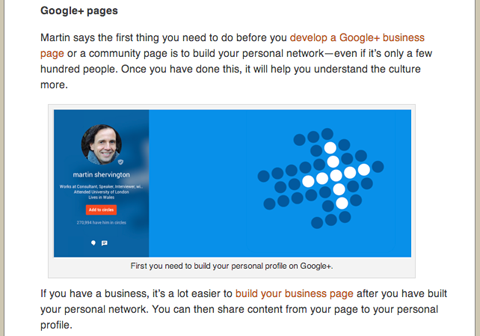 This article shows 11 ways to use Google+ Collections to organize updates from your personal profile or business page. How to Use Google+ to Expand Your Business Influence: Find several ways you can take advantage of Google+ to gain more exposure for your content and your business, such as how to claim authorship and use other Google+ features to participate in communities. These tips will help you establish authority, increase visibility and grow an audience. 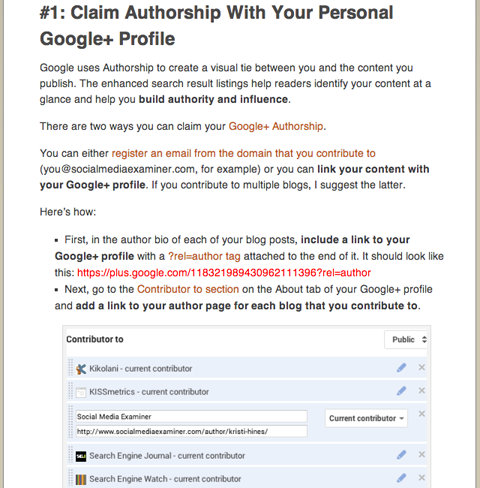 Set yourself up with Google authorship to increase trust in your content. How to Encourage Google+ Fans to Share Your Content: Do you want to find Google+ fans who love what you do and will share it with others? Learn how to use Google+ circles, ripples and searches to identity, monitor and connect with brand evangelists who want to tell the world about you. 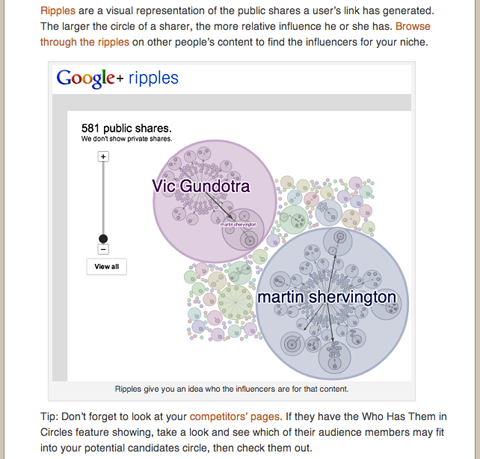 Find influencers on Google+ by flipping cards and researching ripples. How to Grow Your Google+ Engagement: Here are five effective things you can do to take your engagement on Google+ to a whole new level. Use these methods to engage, make your page findable and build long-lasting relationships with your core audiences. 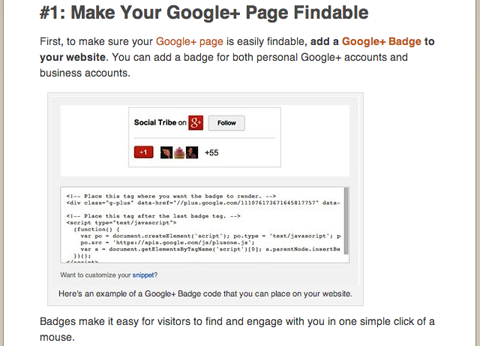 It’s easy to let website visitors know they can find you on Google+. 6 Ways to Maximize Your Google+ Engagement: As the number of people who add their content to Google+ grows, it’s important to optimize your social media posts to generate the engagement that keeps them from getting lost in the stream. Follow the lead of larger brands and use these tips and tricks to increase the engagement activity on your own posts. Use simple operators to add boldface, italics and strikethrough to your update text so it stands out in the stream. 6 Ways to Use Google+ to Increase Your Visibility: With a few simple tactics, you can extend your reach on Google+ and attract additional followers. This article shows six ways to increase your visibility on Google+ and in Google search results. 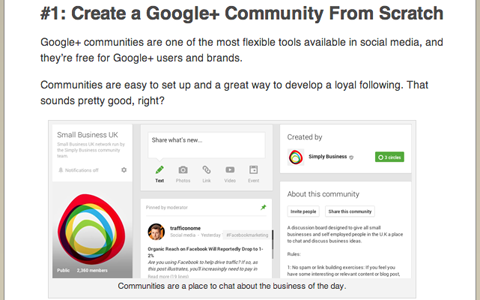 How to Create a Google+ Community to Grow Your Business: When you bring conversations to a central place and encourage collaboration, you provide value for your audience. In this article you’ll find out how to create a Google+ community to connect with people and keep them coming back. Have you considered marketing through a Google+ community? How to Use Google+ for Social Media Contests: Although restrictions apply, there are ways to promote your contests successfully on Google+. 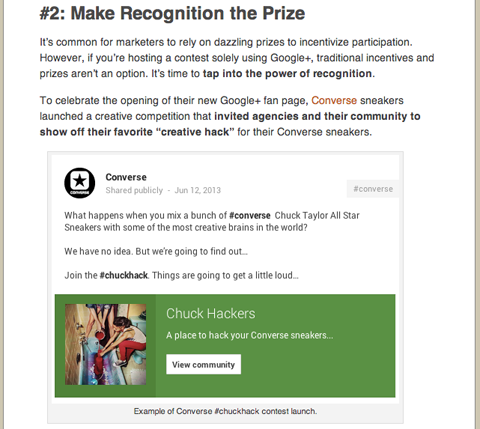 Follow these three examples to leverage Google+ as a core component of your own social contest strategy. Take advantage of Google+ to promote your social contests. How to Use Google +Post Ads to Amplify Your Content: Find out what Google +Post ads are, how to optimize them and how you can use them to promote your business to a wide online audience. 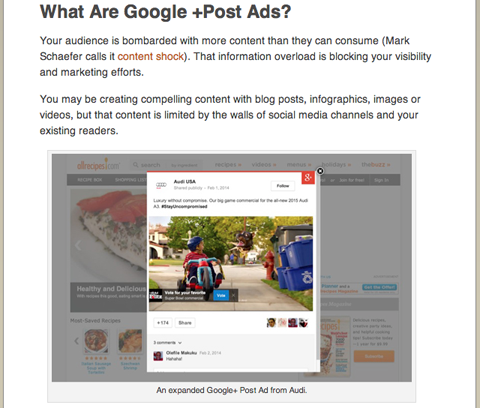 Google +Post ads let you promote your Google+ posts on websites that serve Google ads. Google+ Hangouts: What Marketers Need to Know to Get Started: This Social Media Marketing podcast episode features Brandee Sweesy. 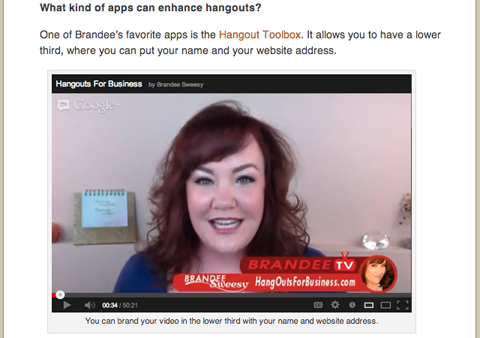 Brandee shares how she uses hangouts to promote her content. Listen in to learn different techniques for branding your own hangouts and the best ways to promote attendance. Make sure your hangout is branded with your name and a website address. 10 Ways to Get Live Viewers for Your Google Hangouts on Air: Hangouts are changing the way brands connect with audiences to share advice, interview influencers and more. 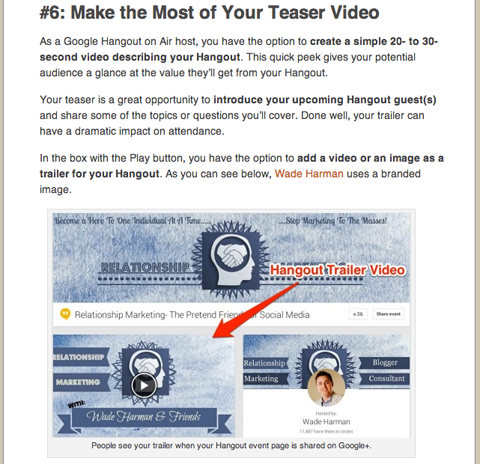 This article shows how to use branding, headlines, audience engagement, trailer videos, hashtags and YouTube links to bring more viewers to your Google hangouts on air. A pre-roll hangout teaser lets people see what’s coming up. How to Stream Google Hangouts On Air to Twitter and Facebook: Are you using Google Hangouts on Air? This article shows how to stream your next Google Hangout On Air to your Facebook and Twitter followers. How to Get More People to Attend Your Google Hangout: Do you host Google Hangouts on Air? This article shares five things you can do to bring more live viewers to your Google Hangout on Air. 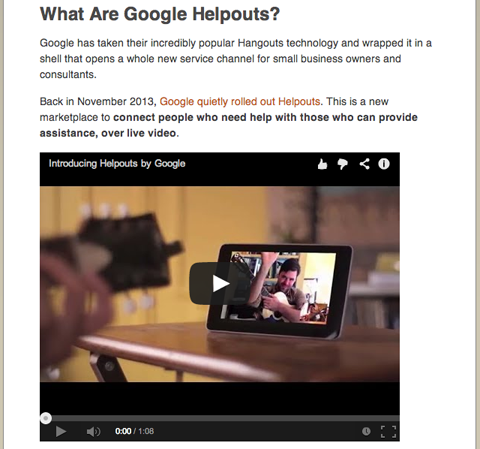 How Google Helpouts Can Grow Your Leads and Your Business: Helpouts are a marketplace that connects people who need help with those who can provide assistance, over live video. Find out how to position yourself as an expert, generate leads and make money by using Google helpouts to share your knowledge and expertise. Google helpouts let you provide one-to-one, on-demand help to customers—for free. 13 Google+ Tools to Improve Your Marketing: If you want to dominate social media, you have to distribute rich media content efficiently and effectively. Google+ helps you do that and more. Use these tools and tips to use Google+ analytics, drive traffic to Google+ with +Post ads, segment your audience, integrate audio and improve posts. You can get some useful metrics from Google+ if you use the right tools. 3 Google+ Tools That Take Your Marketing to a New Level: Grow your presence on Google+ with Friends+Me, Do Share and Steady Demand. These are great tools to share more effectively, audit and analyze your Google+ page. Save time by cross-posting Google+ updates to other social networks. 4 Tools that Measure Google Plus Page Performance: Are you keeping tabs on your Google+ performance? Discover four tools to measure Google+ analytics, identify your key audiences and boost engagement. 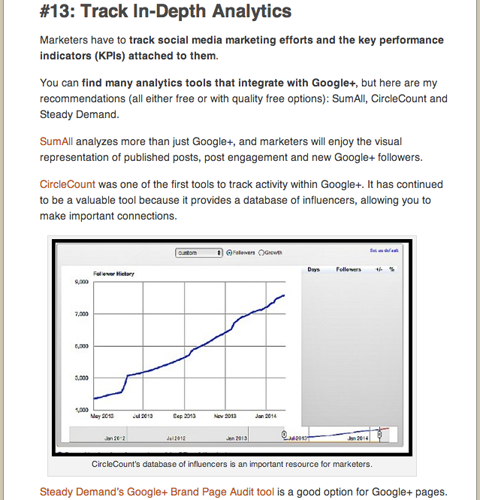 How to Discover Analytics With the Google+ Dashboard: The Google+ Dashboard has greatly improved the analytics it offers. Discover the Google+ page dashboard and the analytics included in each option. To find more tips, tactics and strategies, view a complete library of Google+ articles. What do you think? Is Google+ a part of your social media marketing strategy? 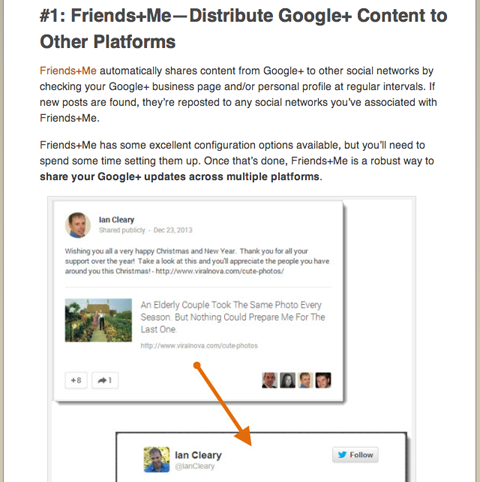 What articles have helped you develop a successful Google+ marketing presence? Please leave your thoughts and comments below.